This was the day I had been waiting for since the DLR and the band split in 1986. A reunion…well, not exactly…not without Michael Anthony. 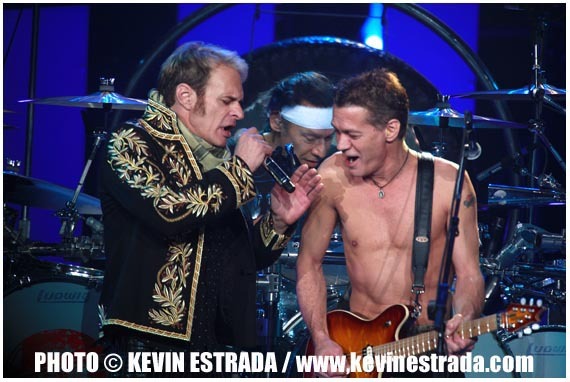 But I think true Van Halen fans, myself included, felt that this was the closest we were going to get to a true reunion. 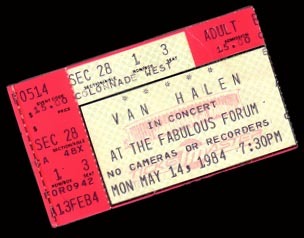 This was the first big press conference I had ever really attended…I really don’t go to these kinds of things…but hey, this is Van Halen! I had never felt so much excitement and electricity in the air that day. Everyone attending had smiles across their faces. And as soon as the band marched through the crowd to the stage, everyone regressed to acting like a teen. Diamond Dave proved that he had not lost the gift of gab, but it was the brotherly hug between Eddie Van Halen and DLR that made the crowd melt. It was magic, if only for a brief moment in time. I was on cloud nine as I left the building that day looking through the bands list of tour dates for the reunion tour. I noticed that the L.A. date fell on my wedding anniversary…ugh! Guess how I celebrated our anniversary? That’s right, my photos came out great! Photographed with my Canon 5D, a Canon 24-70mm 2.8 lens and a Canon 580 EX flash. One thing that you need to understand about my early teens is that local bands were just as big as arena bands to us. 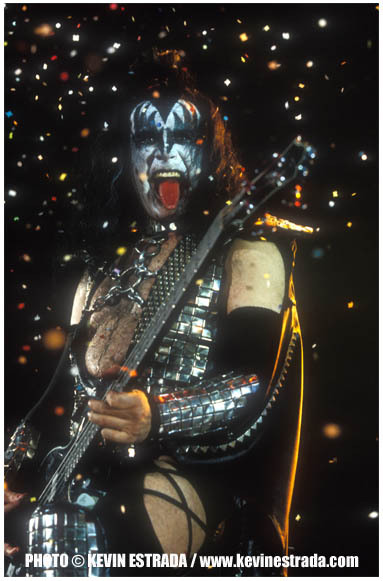 We had the great and unfair advantage of seeing many of our local heroes blow up and become some of the biggest names in rock – Van Halen, Motley Crue, Ratt, etc. Armored Saint was next in line and in prime position. Armored Saint went from being the biggest unsigned local band in the San Gabriel Valley to a household name around the country. During Armored Saint’s rollercoaster of a career, the band faced some serious changes that challenged the future of the mighty rockers. In 1989, the band made a bold decision to replace guitarist Phil Sandoval, recruiting another local hero, Jeff Duncan of Odin. As the new Saint lineup began work on new songs and demos for their upcoming album, guitarist Dave Pritchard was diagnosed with Leukemia. Unfortunately, the aggressiveness of the disease would prevent Pritchard from taking part in the final recording sessions of Symbol Of Salvation. In a heartfelt move, Sandoval returned to Armored Saint, replacing Pritchard and bringing harmony to the Saint Family. Armored Saint honored Pritchard’s memory by using his guitar solo that he recorded on the four-track demo version of Tainted Past for the final album version that was released on Symbol Of Salvation. Photographed with my old Canon AE1 Program and a cheap, no name 70mm-210mm f 5.6 lens. Shot on Kodak Ektachrome film. 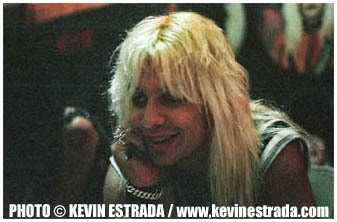 My buddy Rob and I were huge Crue fans growing up. We were fortunate enough to see some of their early and greatest shows during their climb to the top. One of our highlights was when we were crushed against the stage all night for the infamous New Years Evil show at the Santa Monica Civic Auditorium. In exchange for a ride to the show that night, we had to help set up a New Year’s party in the area…we ended up hitch-hiking home after the show. That’s dedication. 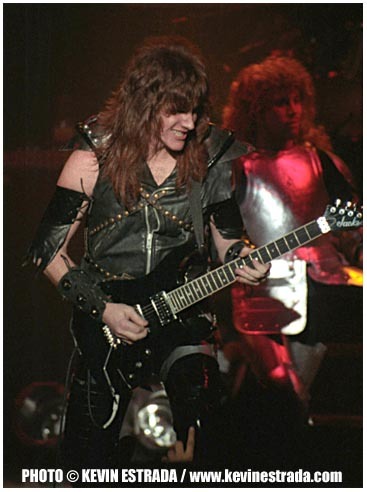 With the release of Shout At The Devil just a few weeks prior, Motley traded in theatrics such as igniting Nikki’s boots on fire for elaborate Road Warrior-esque stage designs. In a move to increase record sales, Elektra Records decided to set up an in-store appearance with Motley Crue. I don’t think they could boost sales any more than they were at…the record sold over two hundred thousand copies in its first two weeks of release. 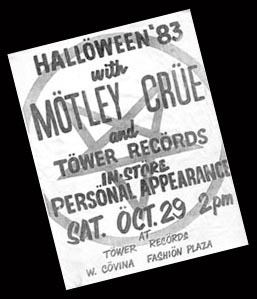 The band chose Tower Records in West Covina…Tommy Lee’s old stomping grounds. This was the biggest event to come to the San Gabriel Valley since Van Halen played their last shows in Pasadena. Rob and I were lucky enough to convince my friend Howie to drive us there early. We got there around 9am and there were already fifty or so kids in line. As we jumped in line, we decided on what we would have the band sign for us. Getting the band to sign my Leather Records version of Too Fast For Love was my priority that day. By noon there must have been 500 kids there, the parking lot was a mess – kids everywhere, cars backed up. Panic started to take over the store management. It was obvious that they did not expect numbers like this. The manager screamed at us through a bullhorn to clear the parking lot, to make a single file line – otherwise the in-store appearance would be canceled. People were booing and throwing things…this could turn into a riot at any moment. As the hundreds of people crammed themselves into a line, the pressure became greater and greater. We were all really starting to get smashed up. My buddy Howie couldn’t take it anymore and he bailed out on us. Luckily we were very close to the front of the line, so we figured we would not have to endure too much more of this. Through the bullhorn they announced that they were going to start letting us in to meet the band. Just then, the pressure really increased as the people in the back of the line all pushed forward. We all pushed back, retaliating to the crowd behind us. They pushed forward even harder this time…. and that was it! The display window that we were leaning against cracked wide open and about twelve of us went flying through the huge glass window into the store. The band could not believe what was happening. They jumped from their seats as a dozen of us fell nearly at their feat, covered in glass and some covered in blood. I remember Tommy with his eyes super wide and his jaw on the ground. All he could say was “No way, dude, no way!” As we met the band, each of the guys took the time to ask us if we were okay and told us how much they appreciated us. That day, the band realized that the loyalty of their fans was taken to another level. Last month I spent the day with Motley in their rehearsal room on a shoot for Rolling Stone. During lunch, I asked Vince and Tommy if they remembered that day and that incident. Right away, their eyes popped out of their heads, just like they did back in 1983. They started talking about it like it just happened…there is no way they will ever forget that day. Photographed with my brother’s Pentax K-1000 and an 80mm fixed lens – no flash (that was all I could get my hands on). Shot on Kodak Negative Film. Van Halen had now broken through to the masses. It was no longer just us long-haired rock/metal fans at their shows. Their hit single, Jump, had propelled them into the big-time…even my mother was singing along with Van Halen. 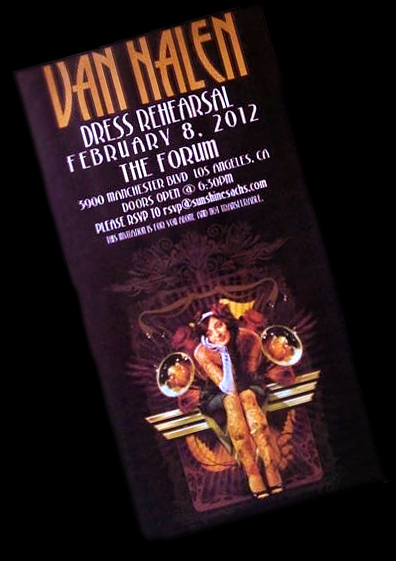 I had some pretty decent seats for both nights at the L.A. Forum, so of course there was no way I was walking through those doors without my camera. I remember looking over my shoulder for security guards and snapping when they weren’t looking. Although this photo has never been published, I have always loved this shot. I really felt that this image captured the feeling of where Van Halen was at that point in their career. I felt that there was some sort of symbolism in the image. 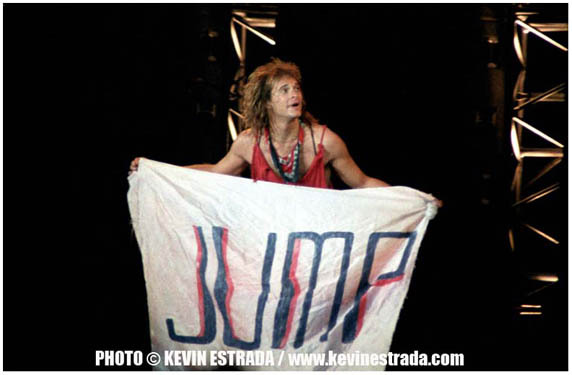 David Lee Roth all alone on that stage holding an oversized “Jump” banner. Little did we know that Dave was about to jump ship. This image stuck with me for years, and it really was my final memory of the Classic Van Halen lineup. 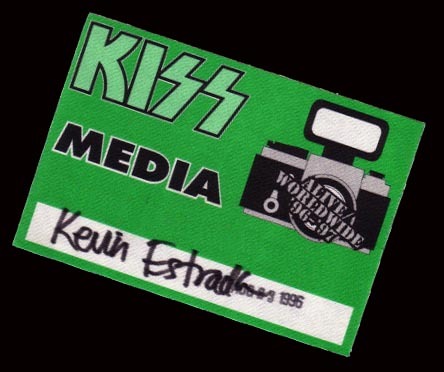 The 1984 tour would mark the last time that I would ever have to smuggle my camera into a Van Halen show…it was all done legally with photo credentials from then on. Photographed with my trusty, smuggled in Canon AE-1 Program and a cheap, no name 80mm-300mm f5.6 lens. Shot on Kodak Negative Film. Part two of a five part series I am doing this week on Classic Reunions. Each day I will add a new photo of a featured artist and that band’s classic reunion. By 1986, David Lee Roth had done his own solo EP, written a book and was talking about doing some acting. After years of tension with Eddie Van Halen, Roth left the band. The relationship had gotten so bad both sides couldn’t even agree on whether or not he left or was kicked out. After that, Van Halen hired and fired Sammy Hagar, tried a stint with Gary Cherone (that bombed big time), and then re-hired Sammy. They were supposed to do a world tour with Sammy, but wound up only playing gigs in North America. For the second time, Sammy exited the band and tensions were erupting between Eddie and Michael Anthony, who had always been close with Sammy. The two had gotten into the food business, with Sammy selling Cabo Wabo Tequila and opening up his club in Mexico, and Michael selling his own line of BBQ Sauce called Mad Anthony’s. This seemed to really piss Eddie off, and when he kicked Michael Anthony out of the band, he complained that Sammy and Anthony were touring together, and singing songs Eddie wrote while selling food and drink. Eddie’s son Wolfgang was brought in to replace Anthony. 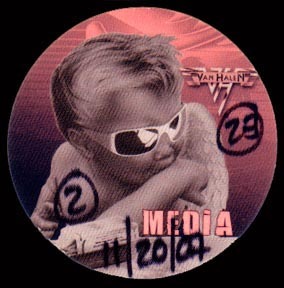 Big offers were always flooding in for a Van Halen reunion, and even back in 1996 the band was set to do it. But even then, Eddie and Dave couldn’t get along and the plans were scrapped. In 2007 it was announced that they were finally going to bury the hatchet, but just then Eddie entered a rehab program. None of us knew what to expect when he came out, but luckily he got out and declared the reunion was still on. Technically speaking, this was not a full Van Halen reunion as Michael Anthony was not included. Still, it was fantastic to see the dynamic team of Eddie VH and DLR once again together on stage. Photographed from the soundboard with a Canon 5D and a Canon 400mm f2.8 lens. This is the first of a five part series I am doing this week on Classic Reunions. Each day I will add a new photo of a featured artist and that band’s classic reunion. Photographed with my Canon EOS-1 and a Canon 70mm-300mm f5.6 lens. Shot on Fujichrome film.